Fosfluconazole (INN) is a water-soluble phosphate prodrug of fluconazole – a triazole antifungal drug used in the treatment and prevention of superficial and systemic fungal infections. The phosphate ester bond is hydrolysed by the action of a phosphatase – an enzyme that removes a phosphate group from its substrate by hydrolysing phosphoric acid monoesters into a phosphate ion and a molecule with a free hydroxyl group (see dephosphorylation). Fosfluconazole was approved by Pharmaceuticals and Medicals Devices Agency of Japan (PMDA) on Oct 16, 2003. It was developed and marketed as Prodif® by Pfizer in Japan. Fosfluconazole is a water-soluble phosphate prodrug of fluconazole – a triazole antifungal drug. It is indicated for the treatment of candida and cryptococcus infections. Prodif® is available as solution for intravenous use, containing 100, 200 or 400 mg of free Fosfluconazole per vial. The recommended dose is 50 to 100 mg administered intravenously once daily for candidiasis. Another dose is 50 to 200 mg fluconazole once daily for cryptococcosis. 2. Org. Process Res. Dev.2002, 6, 109-112. 2-(2,4-Difluorophenyl)-1,3-bis(1H-1,2,4-triazole-1-yl)- 2-propyl dihydrogen phosphate (2). 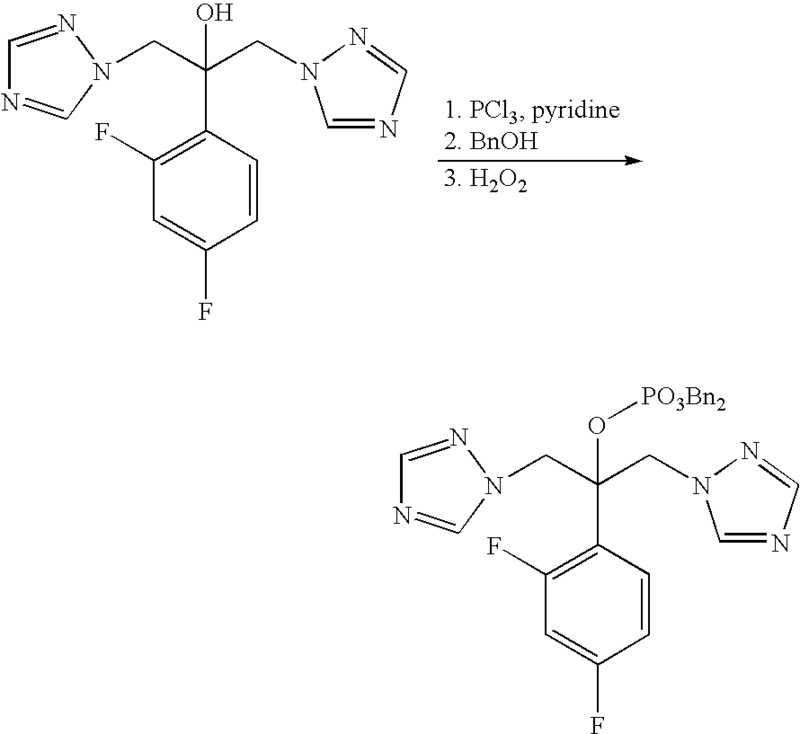 A slurry of dibenzyl 2-(2,4-difluorophenyl)-1,3-bis(1H-1,2,4-triazole-1-yl)-2-propyl phosphate (30.1 kg, 53.13 mol), 5% palladium-on-carbon catalyst (50% wet, type 5R39, 1.5 kg), and sodium hydroxide (4.36 kg, 108.9 mol) in low-endotoxin water (75.7 L) was hydrogenated at ambient temperature and 414 kPa (60 psi) for 12 h. The slurry was filtered, and the catalyst was washed with low-endotoxin water (9.8 L). After separating the toluene by-product, the aqueous phase was slurried with carbon (3.1 kg) for 30 min. After the carbon was removed by filtration, the aqueous phase was acidified to pH 1.45 by that addition of sulfuric acid (6.69 kg) in low-endotoxin water (25 L) over 2 h. The resulting slurry was granulated at ambient temperature for 1 h and then filtered. The product was sequentially washed with filtered low-endotoxin water (103 L) and filtered acetone (103 L). The product was dried under vacuum at 50 °C for 12 h to give the title compound (18.1 kg, 88%) a white powder: mp 223-224 °C. 1H NMR (DMSO) δ 5.07 (2H, d), 5.24 (2H, d), 6.77-6.83 (1H, m), 7.00-7.18 (2H, m), 7.75 (2H, s), 8.53 (2H, s). [MH]+ 387.0786. C13H13F2N6O4P requires: C, 40.43; H, 3.39; N, 21.78; [MH]+ 387.0782. A solution of 2-(2,4-difluorophenyl)-1,3-bis(1H-1,2,4-triazol-1-yl)propan-2-ol (also known as fluconazole, 10.0 g, 32.6 mmol), 1H-tetrazole (6.85 g, 97.8 mmol), dibenzyl diisopropyl phosphoramidite (22.55 g, 65.2 mmol) in methylene chloride (100 ml) was stirred at room temperature under a nitrogen atmosphere for 2 hours. The mixture was then cooled to 0° C., and a solution of 3-chloroperoxybenzoic acid (13.5 g, 50-55% w/w, 39.1 mmol) in methylene chloride (50 ml) was added maintaining the temperature at 0° C. The resulting mixture was allowed to warm to room temperature for 1 hour before washing with aqueous sodium metabisulphite and sodium bicarbonate. After drying (MgSO4) the solvent was removed and replaced with methyl isobutyl ketone (37 ml) and tert-butyl methyl ether (74 ml). After granulating at −10° C. for 1 hour the product was filtered and washed with ice cold methyl isobutyl ketone and tert-butyl methyl ether (1:3, 15 ml) and dried at 50° C. under vacuum for 18 hours to give the subtitle compound (16.05 g, 87%), m.p. 93° C.
Found: C, 57.12; H, 4.46; N, 14.85. C27H25F2N6O4P requires C, 57.24; H, 4.46; N, 14.84%. m/z 567 (MH+) 1H NMR (300 MHz, CDCl3) δ=4.90 (d, 2H), 4.95 (d, 2H), 5.05 (d, 2H), 5.19 (d, 2H), 6.58-6.73 (m, 2H), 6.88-6.95 (m, 1H), 7.20-7.30 (m, 4H) 7.32-7.38 (m; 6H), 7.80 (s, 2H), 8.36 (s, 2H). To stirred ethyl acetate (1530 ml) was added 2-(2,4-difluorophenyl)-1,3-bis(1H-1,2,4-triazol-1-yl)propan-2-ol (also known as fluconazole, 306 g, 1.00 mol) and pyridine (237.3 g, 3.00 mol) before cooling to 0° C. Phosphorus trichloride (137.4 g, 1.00 mol) was added dropwise to the reaction mixture maintaining the temperature between 0-5° C. before allowing the reaction mixture to warm to 15° C. over 30 minutes. Benzyl alcohol (216 g, 2.00 mol) was then added over 30 minutes at 15-20° C. After a further 30 minutes hydrogen peroxide (27.5% w/w in water, 373 g) was added maintaining the temperature at 15-20° C. After 30 minutes the aqueous phase was removed and the organic phase washed with aqueous sodium metabisulphite, dilute hydrochloric acid and water. The solvent was removed at reduced pressure and replaced with methyl isobutyl ketone (850 ml) and tert-butyl methyl ether (1132 ml). After granulating at 20° C. for 1 hour and at 0° C. for 1 hour, the product was filtered and washed with ice cold tert-butyl methyl ether (2×220 ml) and dried at 50° C. under vacuum for 18 hours to give the subtitle compound (358 g, 63%). The melting point and spectroscopic data was identical to that stated in method A. A slurry of the compound of step (a) (9.80 g, 17.3 mmol), 5% palladium on carbon catalyst (50% wet, 1.0 g) and sodium hydroxide (1.38 g, 34.6 mmol) in water (26 ml) was hydrogenated at room temperature and 414 kPa (60 p.s.i.) for 20 hours. The solution was filtered through a pad of celite (trade mark) and washed with water (5 ml). The toluene was separated and the aqueous phase cooled to 0° C. whereupon sulphuric acid (1.70 g, 17.3 mmol) was added. The resulting slurry was granulated at 0° C. for 1 hour and then filtered, washed with water (2×5 ml) and dried under vacuum at 50° C. to give the title compound (5.80 g, 87%). m.p. 223-224° C.
Found: C, 40.28; H, 3.39; N, 21.63. C13H13F2N6O4P requires C, 40.43; H, 3.39; N, 21.76%. 1H NMR (300 MHz, DMSO) δ=5.07 (d, 2H) 5.24 (d, 2H), 6.77-6.83 (m, 1H), 7.00-7.18 (m, 2H), 7.75 (s, 2H), 8.53 (s, 2H). A solution of the compound of Example 1(a) (10.0 g, 17.7 mmol) and sodium acetate (2.90 g, 35.3 mmol) in ethanol (160 ml) and water (20 ml) was hydrogenated over Pearlman’s catalyst (1.00 g) at room temperature and at 345 kPa (50 p.s.i.) for 16 hours. The solution was filtered through a pad of celite (trade mark) and the solvents removed at reduced pressure to leave a thick syrup. This was dissolved in ethanol (100 ml) with the aid of sonication and warmed to reflux. The resulting solution was allowed to cool slowly and granulate for 1 hour at room temperature. The product was filtered, washed with ethanol (10 ml) and dried under vacuum at 50° C. to give the title compound (4.48 g, 59%). m.p. 160-162° C.
1H NMR (300 MHz, D2O) δ=5.01 (d, 2H), 5.40 (d, 2H), 6.60 (m, 1H), 6.79 (m, 1H), 7.11 (m, 1H), 7.63 (s, 2H), 8.68 (s, 2H). Inflammation, gastrointestinal fungal disease, fungal urinary tract infections, fungal meningitis. Synthesis gas itraconazole on forskolin in W09728169, Organic Process Research & Development (200 2), 6 (2), 109-112, CN1789270, Art of Drug Synthesis (2007), 71-82, etc. have been reported in the literature . Which Organic Process Research & Development (2002) described in detail in the first blessing Secretary fluconazole and improved synthetic route for the route problems to adapt to industrial mass production of synthetic routes. 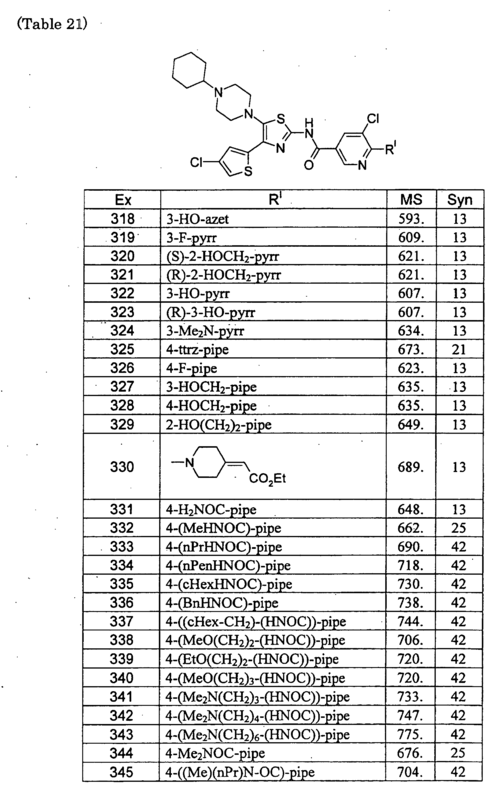 Document Organic Process Research & Development (2002), 6,109-112 discloses the following two synthetic routes. The final step is a route to the removal of benzyl group in a methanol solvent by palladium on carbon catalyzed hydrogenation reaction yield was 65%. Since forskolin fluconazole final product insoluble in methanol, and therefore there is a route following shortcomings: a catalyst poisoning, the final product is easy to form methanol solvate, removing the catalyst in the loss of product, the final product are difficult to separate, low yield not suitable for industrial production. 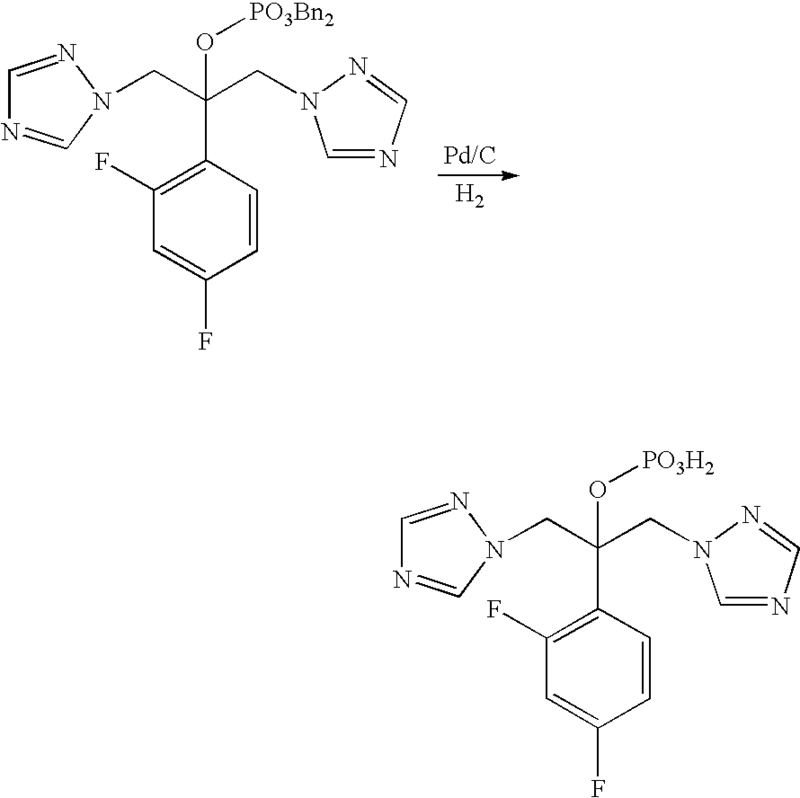 Two routes still using palladium on carbon hydrogenation debenzylation, except that the solvent was changed to sodium hydroxide solution, the product of soluble and stable in aqueous sodium hydroxide solution, after filtering off the catalyst, forskolin fluoro itraconazole by acidification of sodium sulfate can be easily obtained blessing Secretary of fluconazole, the reaction yield of 85-90%. In the prior art, the removal of benzyl preparation blessing Secretary of fluconazole, the use of a pressure hydrogenation, relatively harsh reaction conditions; and blessing Secretary of fluconazole in water and slightly soluble in methanol, for blessing Secretary fluconazole further refined and purified more difficult. The present invention aims to provide a new and suitable for industrial production methods blessing Secretary fluconazole. Step The method according to CN1210540A in Example 1 A or Method B of (a), was prepared to give the title compound, having 1H-NMR shown in Figure 1 (SOi) MHz, DMS0-D6) spectrum. Formula III blessing Secretary fluconazole two benzyl ester (566g, lmol), 120g of dry Pd / C (containing 5% palladium) and ammonium formate (315g, 5mol) in methanol (6L), and stirred under reflux for 5h , TLC monitoring completion of the reaction was filtered, 50 ° C the solvent was distilled off under reduced pressure, ethanol was added (566ml), stirred for beating, and filtered to give a solid forskolin fluconazole salt 415g, yield 98.8%.
] lH-Mffi (500MHz, DMS0-D6) δ: 4.87-4.90, 5.58-5.61,6.56-6.60, 6.94-7.03,7.52-7.61,8.96, having 1H-NMR shown in Figure 2 (500MHz, DMS0 -D6) spectrum. Formula II forskolin fluconazole salt (420g, Imol), in water (IL) while stirring, filtered, 2mol / L sulfuric acid aqueous solution (500ml), 5 ° C under stirring for lh, filtered, cold water ( 200ml) wash, 50 ° C under dry blessed Division fluconazole 379g, yield 98%. Under nitrogen, forskolin fluconazole dibenzyl ester (566g, lmol), 84g of dry Pd / C (5% containing button) and ammonium formate (189g, 3mol) in anhydrous methanol (5L) in the mixture was stirred at reflux for 5h, TLC monitoring completion of the reaction was filtered, 50 ° C the solvent was distilled off under reduced pressure, ethanol was added (300ml), stirred for beating, and filtered to give a solid forskolin fluconazole salt 410g, yield 97.5%. 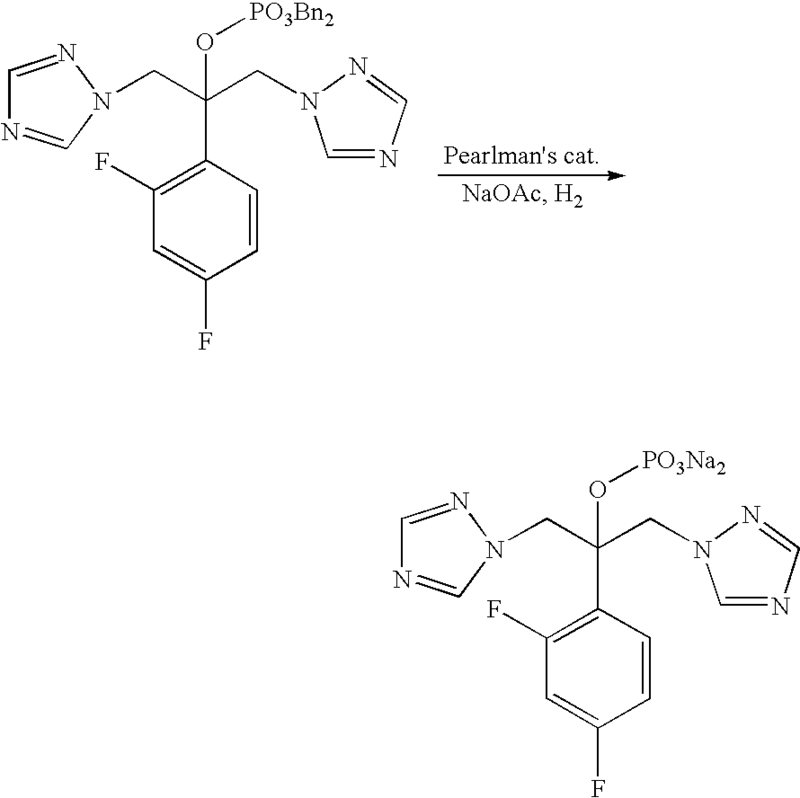 Under nitrogen, forskolin fluconazole dibenzyl ester (566g, lmol), 30g of dry Pd / C (containing 10% palladium) and ammonium formate (315g, 5mol) in anhydrous methanol (5L) in the mixture was stirred at reflux for 5h, TLC monitoring completion of the reaction was filtered, 50 ° C the solvent was distilled off under reduced pressure, ethanol was added (300ml), stirred for beating, and filtered to give a solid forskolin fluconazole salt 405g, yield 96.4%. Under nitrogen, forskolin fluconazole dibenzyl ester (566g, lmol), 30g of dry Pd / C (containing 10% palladium) and ammonium formate (315g, 5mol) in ethanol (12L) and stirred was refluxed for 5h, TLC monitoring completion of the reaction, was filtered, 50 ° C the solvent was distilled off under reduced pressure, ethanol was added (300ml), stirred for beating, and filtered to give a solid forskolin fluconazole salt 395g, 94% yield. forskolin fluconazole dibenzyl ester (566g, lmol), 170g of dry Pd / C (containing 5% of palladium) and ammonium formate (315g, 5mol) in ethanol (16L) was stirred under reflux for 5h, TLC monitoring completion of the reaction was filtered, 50 ° C the solvent was distilled off under reduced pressure, ethanol was added (300ml), stirred for beating, and filtered to give a solid forskolin fluconazole salt 398g, yield 94.7%. Under nitrogen, forskolin fluconazole dibenzyl ester (566g, lmol), 120g of dry Pd / C (containing 5% palladium) and ammonium formate (315g, 5mol) in isopropanol (12L) in the mixture was stirred at reflux for 5h, TLC monitoring completion of the reaction was filtered, 50 ° C the solvent was distilled off under reduced pressure, ethanol was added (300ml), stirred for beating, and filtered to give a solid forskolin fluconazole salt 402g, a yield of 95.7%. under nitrogen blessing Secretary fluconazole dibenzyl ester (566g, lmol), 60g of dry Pd / C (containing 5% palladium) and ammonium formate (504g, 8mol) in methanol (8L) in, 50 ° C under stirring reaction 40h, TLC monitoring completion of the reaction, was filtered, 50 ° C the solvent was distilled off under reduced pressure, ethanol was added ^ OOml), stirred for beating, and filtered to give a solid forskolin fluconazole salt 398g, yield 94.8%. Under nitrogen, forskolin fluconazole dibenzyl ester (5668,111101), 8 (^ dry? (1 / (:( containing palladium 5%) and ammonium formate (315g, 5mol) for n-propyl alcohol (12L) in, 60 ° C the reaction was stirred 20h, TLC monitoring completion of the reaction was filtered, 50 ° C the solvent was distilled off under reduced pressure, ethanol was added (300ml), stirred for beating, and filtered to give a solid forskolin fluconazole salt 398g 95% yield. 2- (2,4-gas-phenyl) -1,3-bis (1H-1, 2,4- sit two P-1-yl) -2-propyl-pity acid dioxide Cool (forskolin fluconazole) Preparation of  under nitrogen blessing Secretary fluconazole dibenzyl ester 566 g (Imol) adding 56g of dry Pd / C (containing 5% palladium), methanol 6L, 315 g of ammonium formate, stirring boil under reflux for 5h, TLC after completion of the reaction was filtered, 50 ° C the solvent was distilled off under reduced pressure, addition of IL of water and dissolved with stirring, filtered, 2mol / L sulfuric acid 500mL, 5 ° C with stirring to precipitate lh, filtered, 200mL cold water, 50 ° C drying 365 g, 95% yield. High performance liquid chromatography (Chinese Pharmacopoeia 2010 edition two Appendix VD): octadecylsilane bonded silica as a filler, Column: Thermo BDS C18 (4.6 X 150mm, 3.5 μ m); methanol as mobile phase A, phosphate buffer (take potassium dihydrogen phosphate 0.68g, set 1000ml water, triethylamine 6ml, adjusted to pH 5.0 with phosphoric acid) as the mobile phase B, a flow rate of 1.0ml / min; column temperature 35 ° C; detection wavelength was 210nm, linear gradient. After the examination, according to the peak area calculation, purity prepared in Example 2-11 was the implementation of the target product of 99.5%. By DR ANTHONY MELVIN CRASTO Ph.D in Japan marketing, Japan pipeline on February 20, 2016 .